ETA: Yay, Lisa! I think Mr. Fleur gets a big hug and kiss for being so awesome! And Beth did love Josh. Until Mick, that was her strongest love. Then, she met the one who rocked her world and was her soulmate. Pretty heady stuff. Then, she met the one who rocked her world and was her soulmate. SS, absolutely no need to duck!!! I agree with you to a certain point. I absolutely think she should have cut Josh free much earlier than she (almost) did. I think that's something we can all agree on. I guess it comes down to how you see her as a result of that failure. For me it's not about forgiving her for that - or condemning her either - I think it's about seeing her as someone who handled a situation very, very badly. And I do think she realised that and regretted. I have far more issues with some of the character development the writers gave her towards the end of the series - but this one, I find easier to understand and empathise with. She treated a good guy badly. To me, that was a failing - but a very human one. No cutlery, SS. As much of a Mick Beth gal as I am, I can tolerate other viewpoints and you do make a compelling case. Things affect us differently, and you felt a strong reaction to Beth's behavior--nothing wrong with that. I guess I just felt that Mick had done so many bad things in his past, that Beth's behavior paled in comparison. 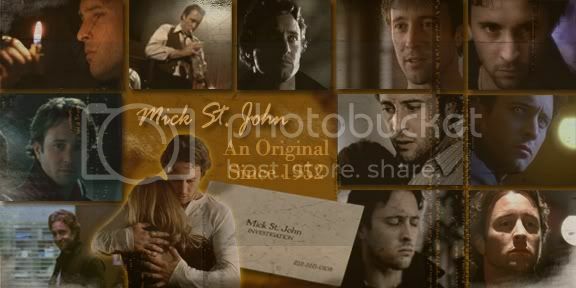 Unfortunately, we cannot help who we love sometimes--and Mick definitely had his choices, too. He could have never faced Beth, or chose to stay away from her. He had strong feelings for her as well. The best part of this show, is that it allows us to each find different things and I personally adore hearing other's reactions and feelings regarding how they view the episodes. It broadens my views--which is a very good thing! Thanks hon!! And, since just about everyone who is anyone is here--I will go off-topic one last time (tee-hee) to say that we are leaving a day earlier for our vacation--Sun. instead of Mon. I will miss you all and try to get on here every now and again to get my fix. No cutlery from me either SS. I had a stronger reaction to Beth still being with Josh in later episodes after other information had come to light for Beth and she had realised her feelings for Mick and still remained with him. I just feel that at the time of BC things where so up in the air for Beth and her feelings where confused and she reacted in the way she did. Was it the correct reaction? - it's obvious that everyone has a different viewpoint. Beth is human and made a mistake in regard to Josh. One more thing on Beth not cutting Josh loose, I do think there was an element of not wanting to end up with no-one. She knew the chances of getting something long-term with Mick were shaky, no matter how much she wanted him and if she'd ended things with Josh, there was a real chance she would have been alone. I don't condone nor justify Beth's behavior. I certainly don't forgive it, but I DO understand it. You can't argue with love - love doesn't allow it. It swamps you, takes you over, and people get hurt in its wake. Should Beth have handled Josh differently? God yes. But...there's no more uncomfortable place for a woman to be than between two men she loves. I still maintain that Mick is not blameless in all of this. He had ample opportunity to turn her away or tell her to stay away from him, but chose not to. He couldn't fight his attraction to her any more than she could fight hers to him. SirenSong wrote: I guess my problem with all of this discussion is how easily people can forgive Beth's behavior. I've never understood it. Yes, Mick isn't perfect, but he certainly thought of Beth's boyfriend and the implications of her coming on to him more than she did. Talk about trying to save someone from themselves. The bottom line for me is that Mick is free, Beth is not. She definitely should have turned Josh free when she realized that she had growing feelings for someone else and certainly when she started more than just flirting (AD). It made Beth unlikable in my eyes. Up until AD, I was thoroughly on the MickBeth love train. But to me, as long as she insisted on keeping good guy Josh in tow, it made her someone I could no longer relate to. Shall I duck the cutlery now? No ducking needed SS. No one here will be throwing anything - all opinions and perspectives are welcome and respected. To a degree I agree with you. Once Beth started having feelings for Mick she should have been honest with Josh. I think her problem was Mick continually telling her that there was no hope of a relationship between them. So, on the one hand she has this undeniable connection with the vampire (although she doesn't even fully understand why). On the other hand, there is no future for them. Does she cut Josh loose while she still can't make heads or tails of exactly what this is between her and Mick? She's confused, and I think understandably so. Morally, and ethically she should have broke up with him. But its never that easy. Congratulations Lisa! I've been looking at those mini laptops myself. But Mick did try - and he succeeded for a while. I think we were supposed to believe that they were both battling the inevitable. I can't speak for anyone else, but I certainly believed it. PNWgal wrote: I don't condone nor justify Beth's behavior. I certainly don't forgive it, but I DO understand it. And I am sure a few of us have been in a position where we may have strung a guy along far past the point when we should have cut him loose. I see that as a distinctly human behavior. Not a moral one, but very normal nonetheless. redwinter101 wrote: SS, absolutely no need to duck!!! I agree with you to a certain point. I absolutely think she should have cut Josh free much earlier than she (almost) did. I think that's something we can all agree on. I guess it comes down to how you see her as a result of that failure. I agree Red. It is indeed extremely human to ignore the needs of our partner when we're falling for someone else. We all make excuses as to why we're doing whatever it is that we're doing. She was definitely human - and who could really resist Mick? It's just not pretty to watch. and Mick? I think he did act like the perfect gentleman. He didn't openly question her behaviour, thus not embarrassing her; he gave her what she needed (a cold shower!) not what she wanted (a good 'turning'); and best of all.... he was discreet. Couldn't ask for more gentlemanly behaviour than that. In agreeance with you both! I wish the writers had shown us a bit of her struggling though to do the right thing - because Mick always does. Yes...we've all been there I think. I think if Mick had given her the option up front she would have ditched Josh in a second. Poor Josh was in the unenviable position of being the second place getter - and should have been ditched for those reasons alone as a kindness to him.